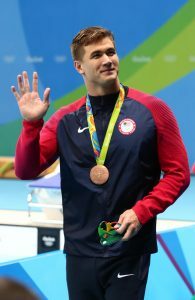 In the fastest sprint event in swimming, known as the splash-and-dash, Bremerton’s Nathan Adrian won the 50-meter freestyle 21.73 at the Arena Grand Prix on Friday night. Adrian’s time is the fifth-fastest time in the world so far this year and gave the Olympic gold medalist a sweep in the sprint events. He won the 100 free on Thursday. In a race that is timed down to the hundredth of a second, Adrian’s shoulder-length lead was too large of a distance for runner up Roland Schoeman of South Africa to overcome. Schoeman finished in 22.19 and Josh Schneider was third in 22.24. Wow. If you can’t trust your coach…. LAUSANNE, Switzerland (AP) — Swimming’s governing body says an Estonian coach has been banned for life after spiking his athlete’s drink with anabolic steroids. Stepanenko received a one-year ban which expires on July 22, 2014. She tested positive at an Estonia vs. Finland meet in Tallinn in May. You’ll have to check out this New York Times video showing the progression of the 100-meter freestyle from its inception to Nathan Adrian’s win in London in 2012. Olympic champion Ryan Lochte announced at the Mesa Grand Prix Saturday night that he would indeed be moving from Gainesville, Fla., to California sometime this summer. Lochte, who had hinted at the move following the London Olympics but backed off that statement, told SwimSwam that the move to either Southern Californa (USC) or Northern California (California Aquatics) would depend on if his reality show “What Would Ryan Lochte Do?” gets picked up for a second season. WWRLD airs April 21st on E!. Here’s a link to the video and story. Bremerton’s Olympic champion Nathan Adrian was the top qualifier in the 100-yard freestyle Thursday morning at the Arena Grand Prix meet in Mesa, Ariz.
Adrian finished with a time of 49.68 seconds. Ricky Berens of Longhorns Aquatics, and Olympic teammate, was second in 50.09 while Darian Townsend of Tucson Ford rounded out the top three spots (50.25. Also making tonight’s finals were the recently-married Matt Grevers (he and Annie Chandler were married in San Antonio last weekend) and Adrian’s Cal teammate Anthony Ervin. The finals are at 5 p.m. and can be viewed live here. Jefferson County’s only public swimming pool has been closed since November for repairs, but it looks like the pool will be open on Friday. The pool, which is owned by the Port Townsend School District and leased by the city, has a new liner as well as changes to the dressing room, deck and pump room. You can read the full story by Tristan Hiegler of the Port Townsend Leader here.